InterExchange Camp USA places general counselors, activity counselors and support staff at summer camps throughout the United States. We recruit international applicants who are skilled, hard working, dedicated to the ideals of camping and committed to learning about American culture. InterExchange works with international cooperating organizations (International Cooperators or “ICs”) to recruit qualified camp staff from many countries around the world. Personalized service from dedicated InterExchange Camp USA program professionals. Your own placement specialist who will identify candidates truly appropriate for your camp. Thoroughly screened applicants, interviewed by an InterExchange Camp USA placement specialist or a trained International Cooperator. DS-2019 Forms and visa application support for all of our participants. 24-hour program support throughout the summer. Each fall, InterExchange and its International Cooperators distribute promotional materials and organize information sessions abroad to attract a select pool of skilled applicants. Between the ages of 18 and 28 during the summer of participation. International students, teachers, youth workers or individuals with specialized skills. University students, if applying for support staff positions. Fluent in English and able to attend an orientation and interview in their home country. Experienced and/or enthusiastic about working with children in a camp environment. Highly motivated and committed to the program for 8 to 15 weeks. 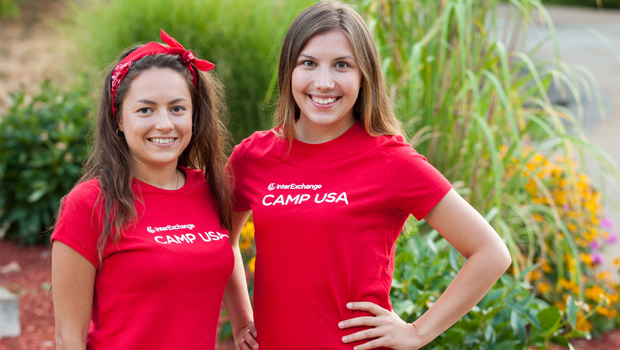 InterExchange Camp USA is committed to selecting and matching the most qualified candidates to prospective camps. We understand and appreciate the importance of camper safety; we work with you to address your safety concerns by maintaining strict standards and procedures throughout the selection process and to address questions during your participation in the program. Continue to the next chapter, Program Options, or return to the Table of Contents.